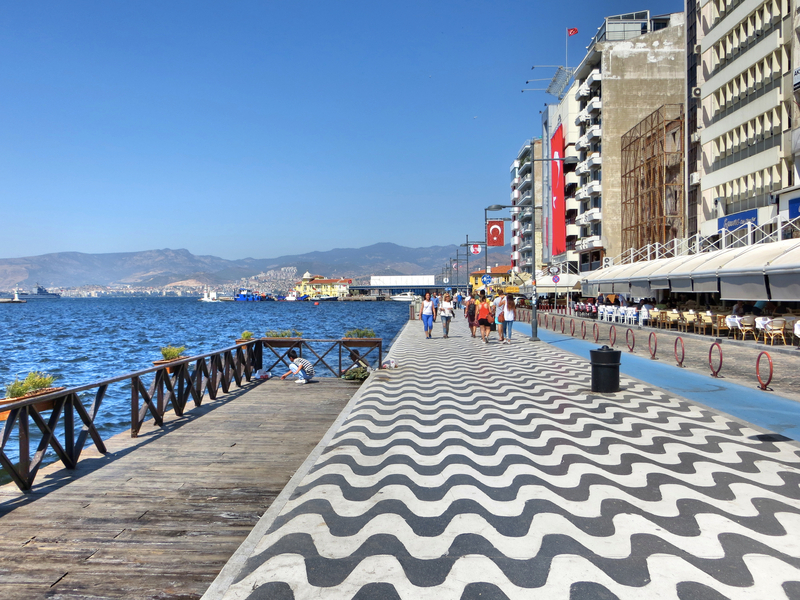 A small part of the long boardwalk along the coast of Izmir. It’s lined with bars, cafés, and restaurants that, I’m confident, were pretty bad. I was amused to note the absence of a railing or other barrier for miles; I don’t think that would pass muster in much of the U.S.
Why would anyone go to Izmir, willingly at least? It’s a port on the Mediterranean, but there are no great beaches in or near the city. 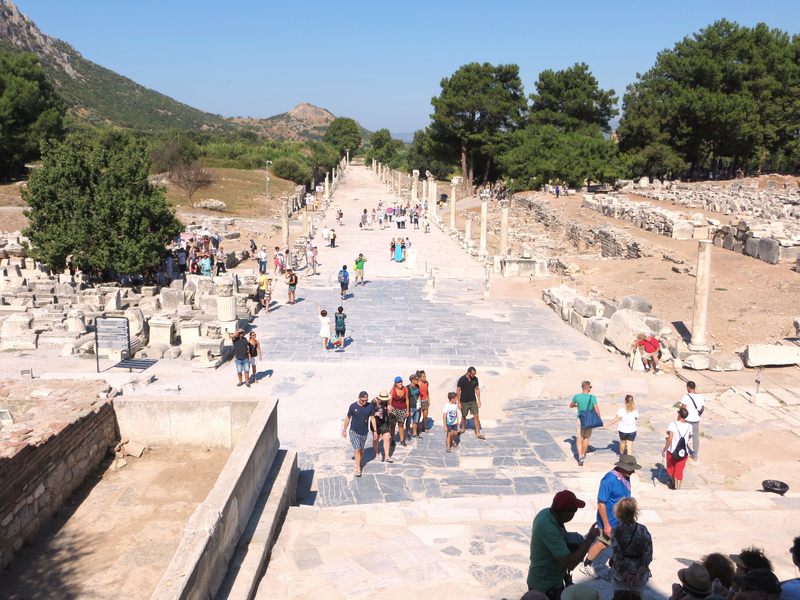 It’s smack in the center of the great Greek and Roman civilizations, but there are no eye-popping ruins. A century ago it was a great multi-cultural melting pot, but much of that was destroyed in the Great Fire of 1922. 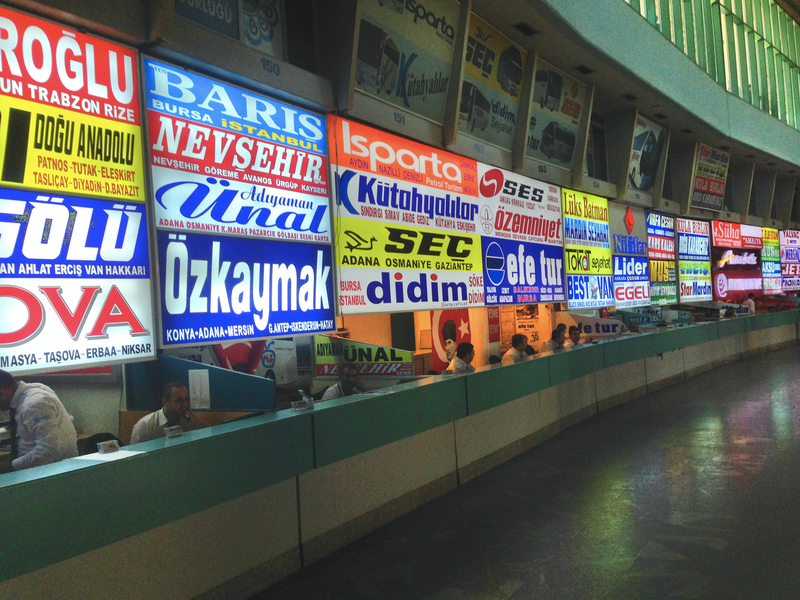 These are just some of the bus companies operating at the Izmir bus stop. 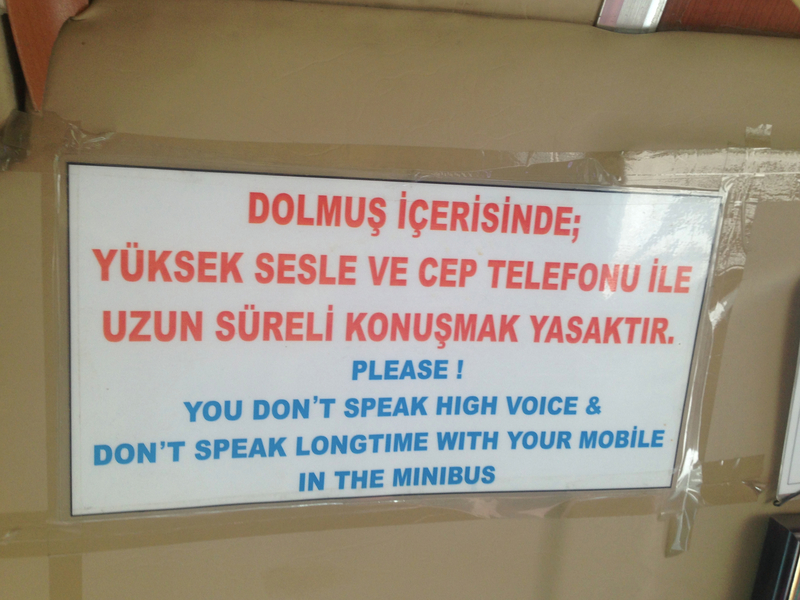 We’re getting around Turkey on buses and dolmas, minibuses that ply secondary routes. The system is comprehensive and the buses have been really good. But gee, how many bus companies do they need? A lot, apparently. We loved this sign on one of the dolmas we took. Would that everyone took that advice in public places. Turns out that’s a question I asked 40 years ago when the ship I was on, home-ported in Naples, sailed to Izmir for a couple of weeks. I mean, no one’s even heard of Izmir! At the time I didn’t understand it, but I have a little better sense of it now. Izmir, you see, was known as Smyrna for many centuries and it was one of most important ports in the eastern Mediterranean. So yeah, no one’s ever heard of Izmir, but Smyrna was a major city for many hundreds of years. It played a key role in the Greek-Turk war that followed World War I and that led to the creation of the modern Turkish state. Today, then, it’s Turkey’s third-largest city (after Istanbul and Ankara), and a nice little place to land for a couple of days. 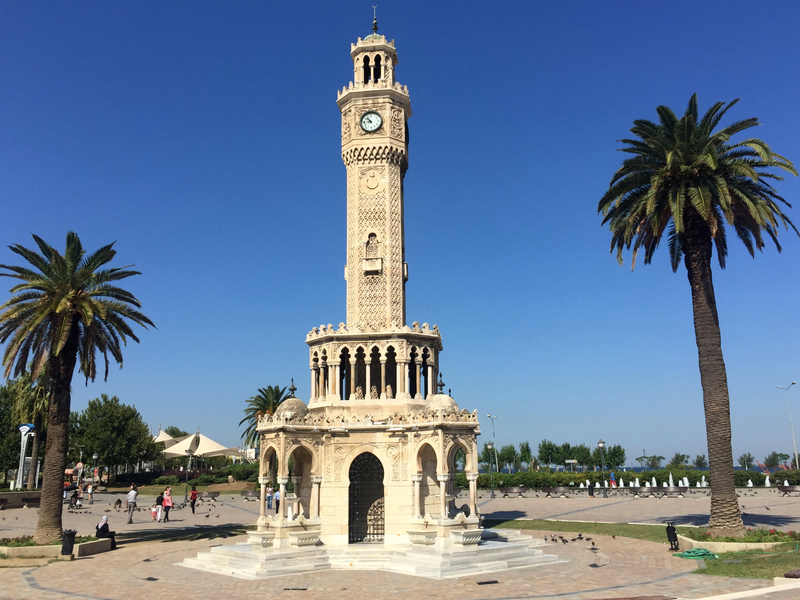 To be sure, you don’t need a lot of time to see Izmir, but for a couple days it’s got a little feel of Europe in Anatolia, somewhat more liberal than the rest of Turkey. 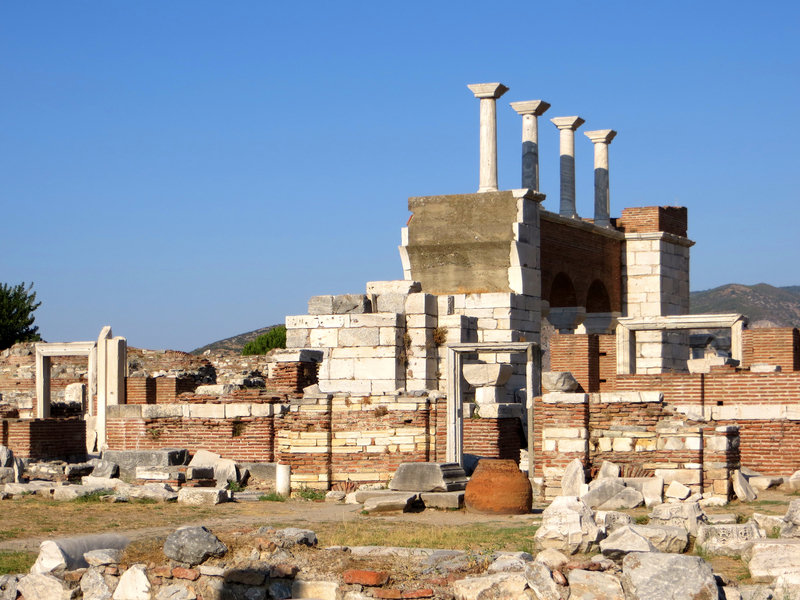 The quick history: Smyrna was founded by Greek colonists some 3,000 years ago. The Persians took control, but Alexander the Great recovered it for Greece. Alexander, in fact, is given credit in legend at least for Smyrna/Izmir’s current location; he allegedly had the city moved based on a message he received in a dream nearby. 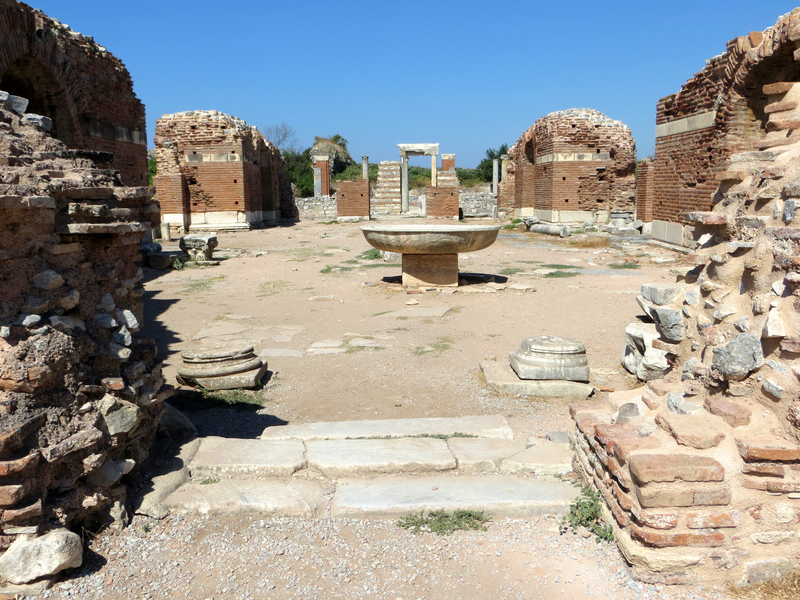 In Roman times it was, along with nearby Ephesus (Izmir is maybe 55 miles north of Ephesus), one of the major cities in Rome’s Asian province. Fast forward a couple thousand years; Smyrna has been an important center of commerce under the Ottoman Empire. But the Ottomans were on the wrong side of World War I, and in the subsequent treaty the Sultan gave away huge amounts of his Empire. With Western support Greece invaded Anatolia, taking Smyrna on May 15, 1919, and headed up towards Istanbul; it appeared as though even the rump territory ceded to the Ottomans was going to be taken over. Enter Mustafa Kamal (known to history as Ataturk, Father of the Turks) at the head of the Young Turks. They had effectively gone to war with the Sultan over his capitulation after the War, but now mobilized to stop the Greeks. Surprisingly, just years after having been all but wiped out in World War I, they did in fact stop the Greeks and pushed them back to Smyrna. Kamal’s troops retook Smyrna on September 9, 1922, more than three years after the Greeks had first captured the city; that day is now celebrated as the victory of the Turkish War of Independence. 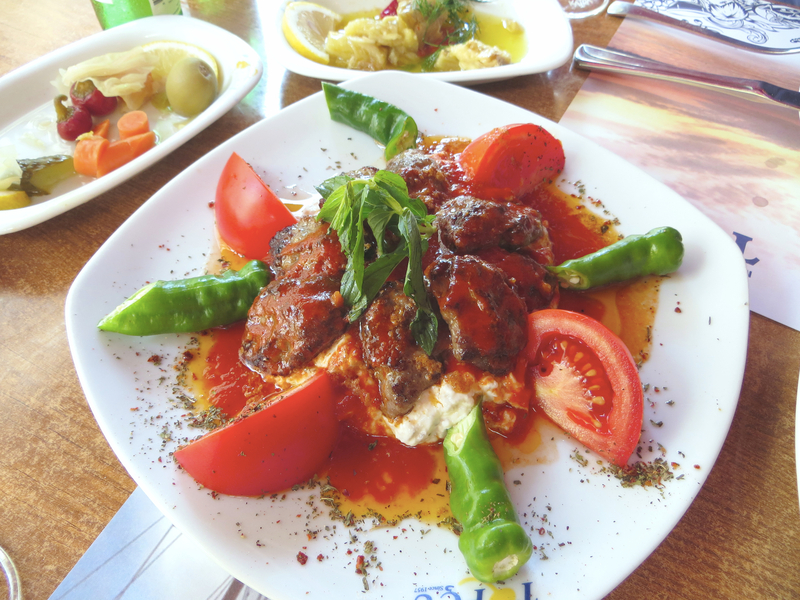 This is what we loved about Izmir; there was some great food. This dish – grilled meatballs on an eggplant-yoghurt with tomatoes was fabulous. In fact, we had it for lunch all three days we were there! As long as I’m showing food, here’s another meal, dinner this time. 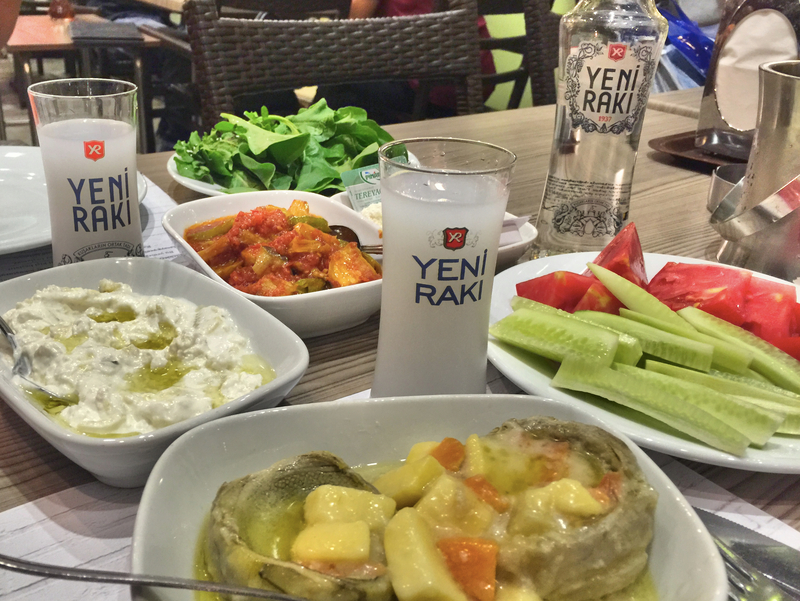 Artichoke, more eggplant yoghurt, veggies, and of course some raki. 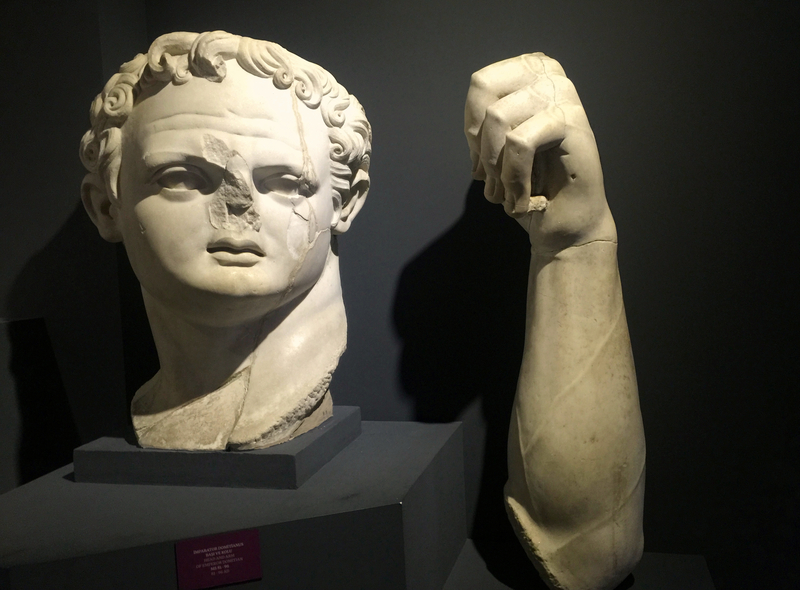 Unfortunately – but perhaps not surprisingly, given the realities of war – victory was followed quickly by catastrophe. While the Greeks and Armenians were trying to escape Smyrna (the Armenian Genocide had occurred less than 10 years earlier) an enormous fire started, destroying most of the Old City and killing anywhere from 10,000 to 100,000 people. Surviving Greeks, then, were eventually shipped to Greece as part of the final treaty that ended the war: Greece agreed to send Turkish Muslims to Turkey while Turkey shipped Greek Christians to Greece. 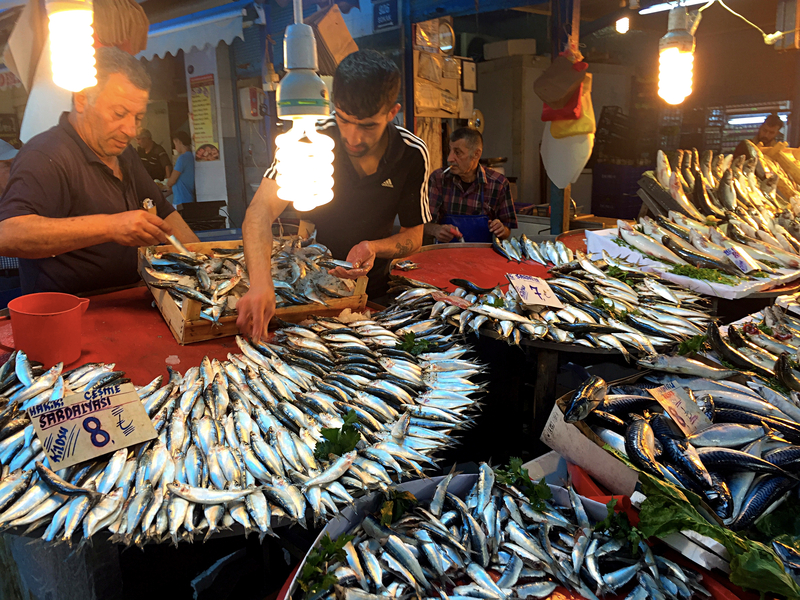 Thus little of the genuinely multi-ethnic spirit of Smyrna remains in today’s Izmir. That’s the city’s story, then. For us, there was one historic site that we enjoyed. 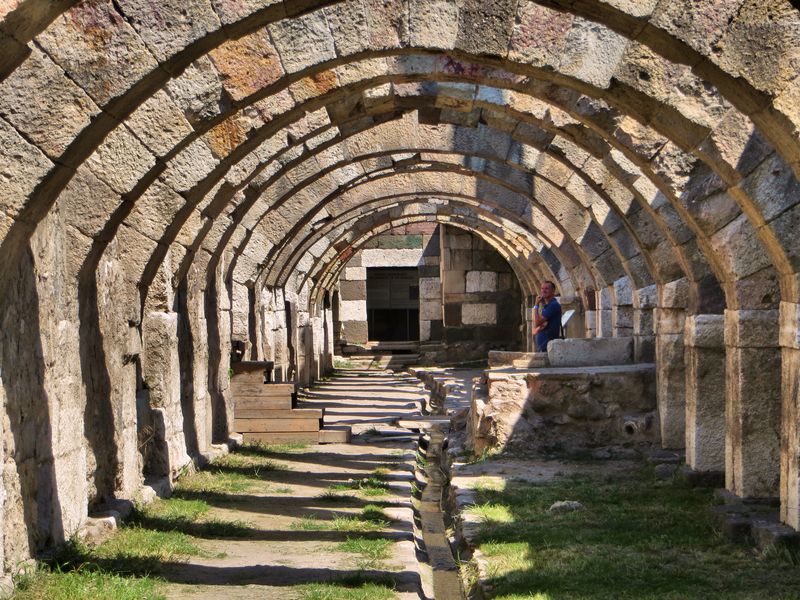 The Agora – the central part of the ancient city – was built originally for Alexander the Great, then rebuilt after an earthquake in the second century AD by Roman Emperor Marcus Aurelius. 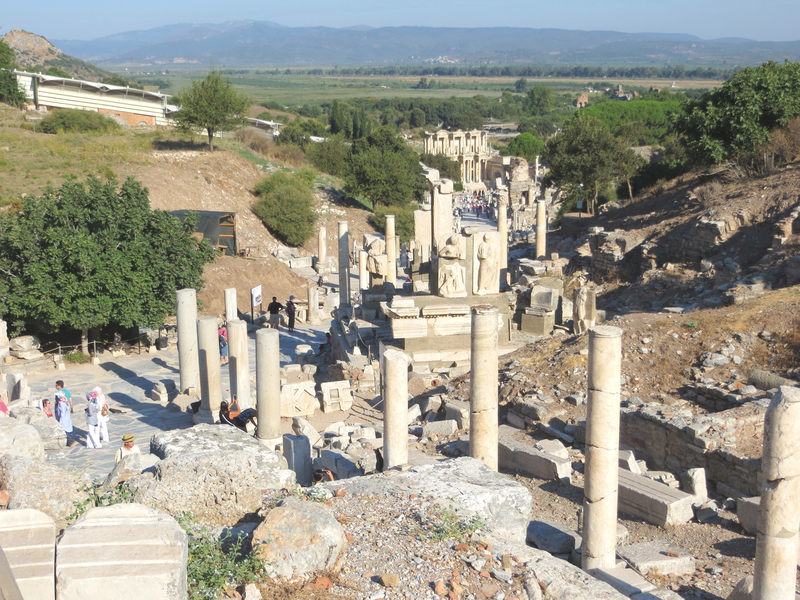 At first the site looked pretty boring, particularly after touring Ephesus just days earlier, but eventually we discovered the excavated basement of a great basilica on the site. That was fun, and very photogenic. 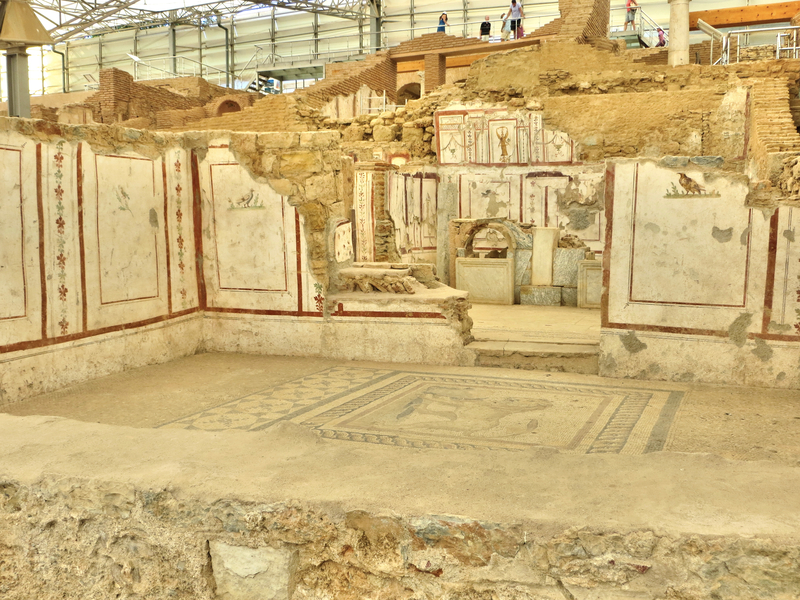 The excavated basement of a Byzantine basilica. You can see Mark over on the right admiring the site. All in all, Izmir made a nice little stop. There’s a long walkway along the coast that’s pleasant. 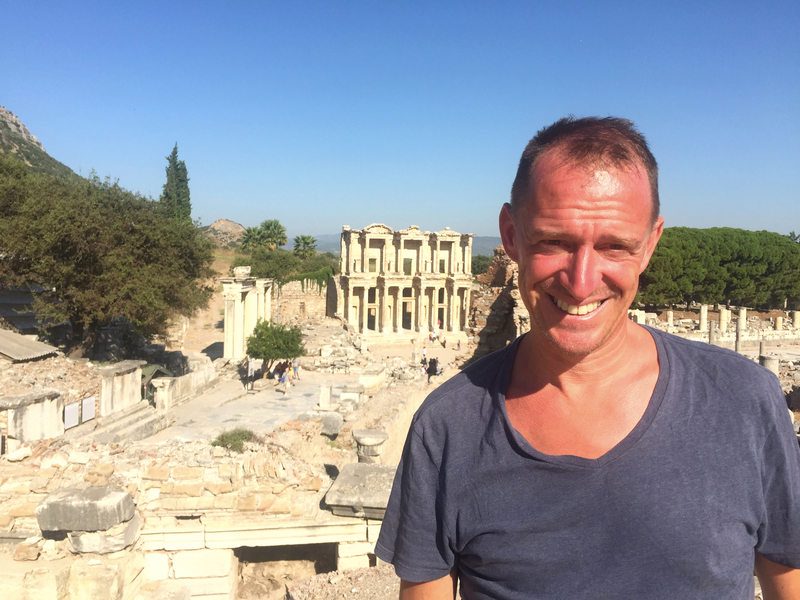 There’s a huge Culture Park near the center of the city, occupying a big part of what had been the Old City before it was destroyed by the Great Fire, where I spent a few hours reading and watching Izmir go by. There’s a busy market area that I remember from my visit in 1975 (though it seemed a lot less exotic now than it did then, when it was the first time I’d ever seen anything like it). And there was some decidedly good food, which always makes for a place we would like. 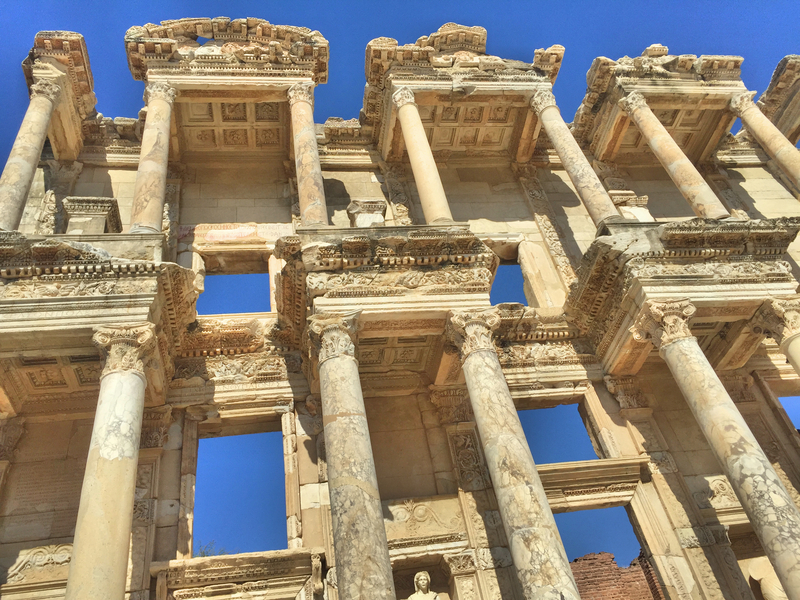 Otherwise there’s not that much to do in Izmir; it’s the sort of place that’s probably worth a visit every 40 years or so. The relative low-key nature of our stop may have been a good thing, though, as it gave us time to start thinking seriously about our winter plans. For a while we’ve had a general notion that we would spend the winter in Africa, but now we’re starting to put some meat to those sketchy ideas. It is a little strange, I’ll admit, to be dreaming of Africa while sitting in a café in Izmir, that I can attest that it does happen. 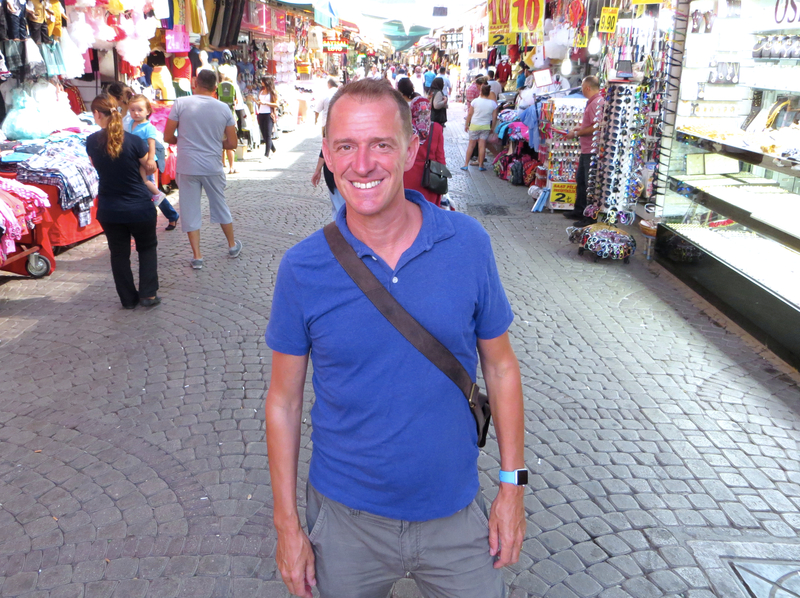 Mark in Izmir’s bazaar. This was relatively early in the day, but it gets more lively later on. 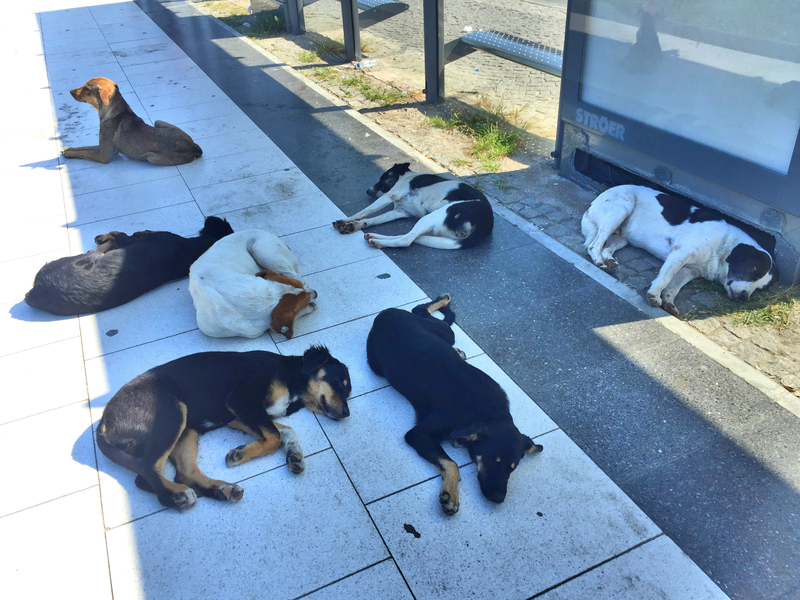 And finally, just to show you we don’t just take pictures of cats, here are some of Izmir’s finest dogs. We’re amused to observe that in East Asia, stray dogs are all small and uniformly a light brown. 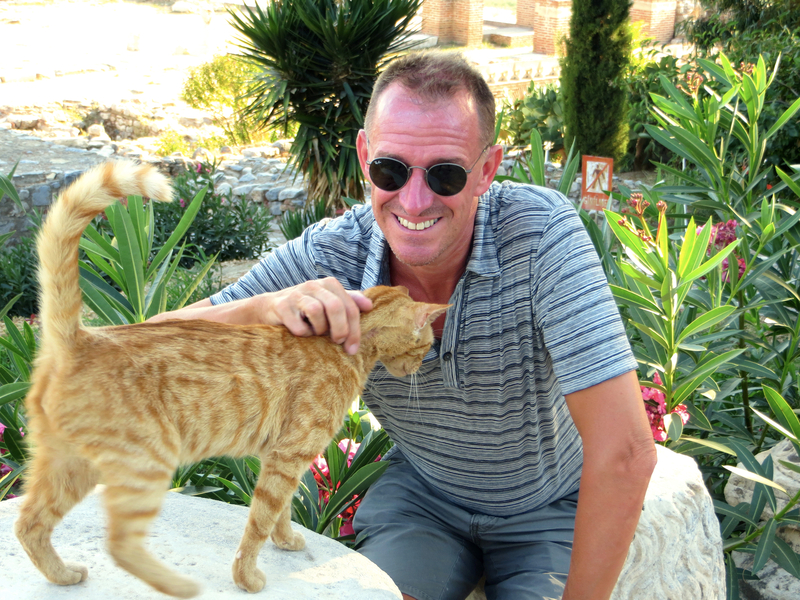 Here in Asia Minor the strays are much bigger and varied in design. Just an observation. OK, there’s gonna be a lot of pictures here. Ephesus: home of the Ephesians to whom Paul wrote that letter, capital of Roman Asia Minor, longtime residence of John the Apostle and allegedly the Virgin Mary, site of Cleopatra & Mark Antony’s rendezvous before their final defeat at Augustus’s hands, and the location of the Temple of Artemis, another of the Seven Wonders of the Ancient World. According to the ancient Greek historian Strabo, at the time of Augustus Ephesus was second only to Rome in term of size and importance. And into the 5th and 6th century, Ephesus was the most important Asian city in the Byzantine Empire save for only Constantinople itself. There’s a lot here, and we have pictures of all of it. 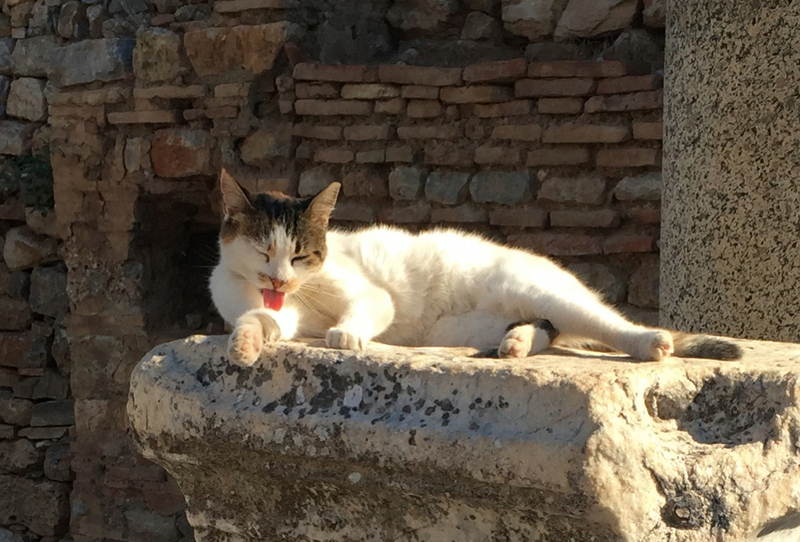 This little cutie greeted us very shortly after entering the ruins of Ephesus. She wasn’t alone. 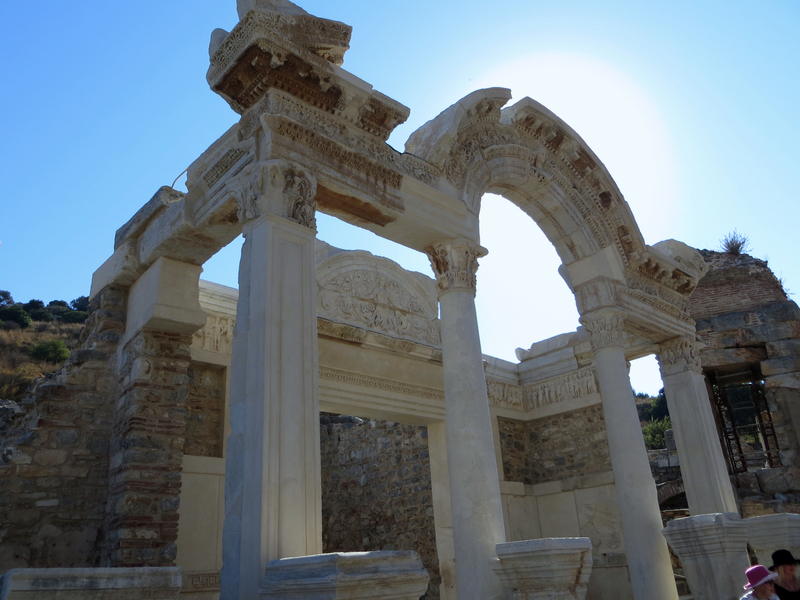 It’s worth noting that this was my second visit to Ephesus. 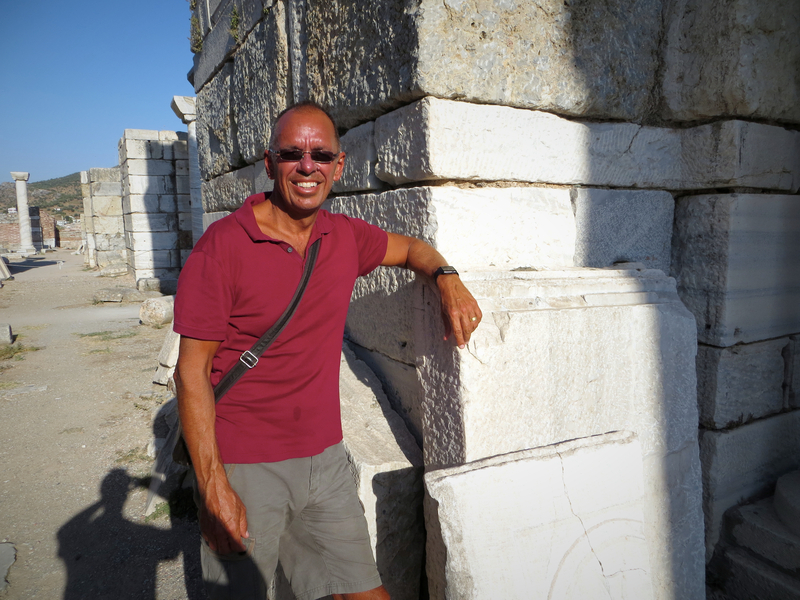 In February 1975 the ship I was on sailed to Izmir and a group of us did a day-trip to Ephesus. Nineteen-year-old Jim really didn’t know anything about anything at that time, and so over the last several years I’ve been eager to see it again so I could truly appreciate it. Mission accomplished – I really appreciated it this time. Who knows, maybe I’ll come back again in another 40 years, this time as hopefully spry 99-year-old. 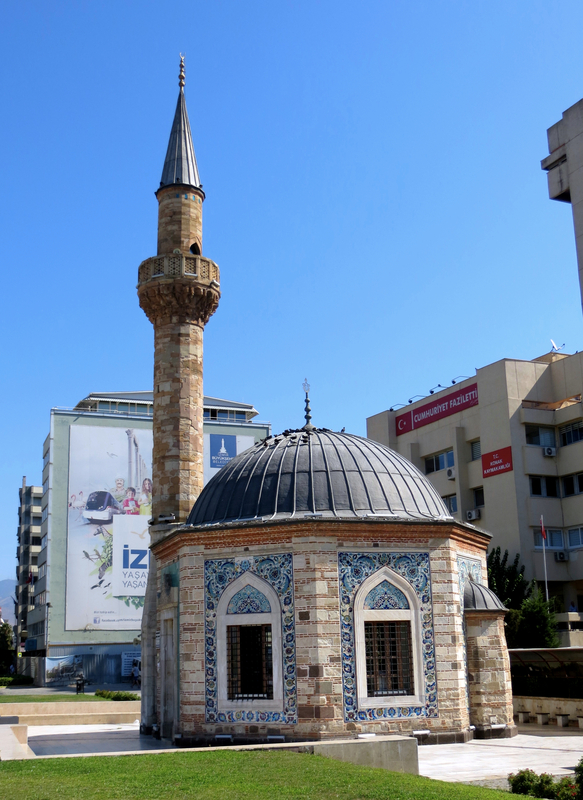 The 14th century Mosque of Isa Bey sits just below the Basilica of St. John. They appear to coexist peacefully. 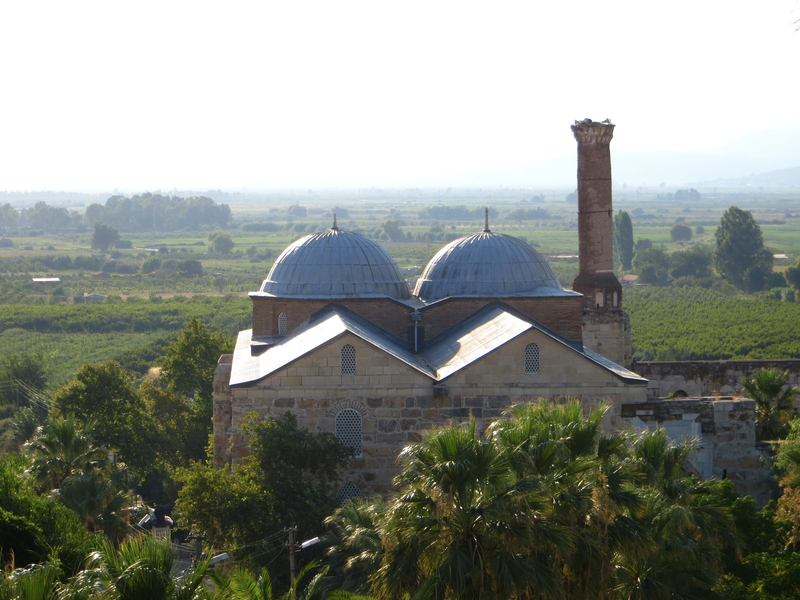 The highlight of Selçuk itself is the remains of the Basilica of St. John, a 6th century church commissioned by the Emperor Justinian on what was believed to be the site of John the Apostle’s tomb. It is known historically that some point after the death of Christ, probably around 55 AD, John left Jerusalem to avoid persecution and came to Ephesus. While here he is believed to have written the Gospel According to John along with three Epistles. He may have been exiled at some point to the island of Patmos where he would have written Revelations, though many believe that was a different John. At any rate, he died in Ephesus (probably the last of the apostles to die) and as Christianity gained in popularity his tomb eventually warranted the Emperor Justinian’s attention. Posing, just a couple minutes after having been stung on my finger by a wasp. That hurts! The basilica was massive and the ruins are impressive. 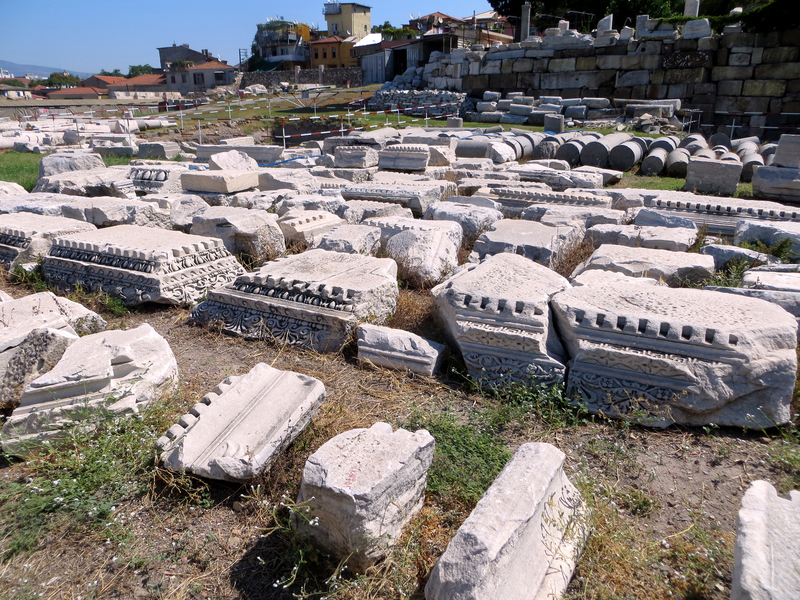 What really amazed me, though, looking at the ruins, was the realization that the Basilica of St. John is actually a few years younger than the Hagia Sophia, the former Greek Orthodox cathedral that still stands in Istanbul, though is now a museum rather than a church or a mosque. 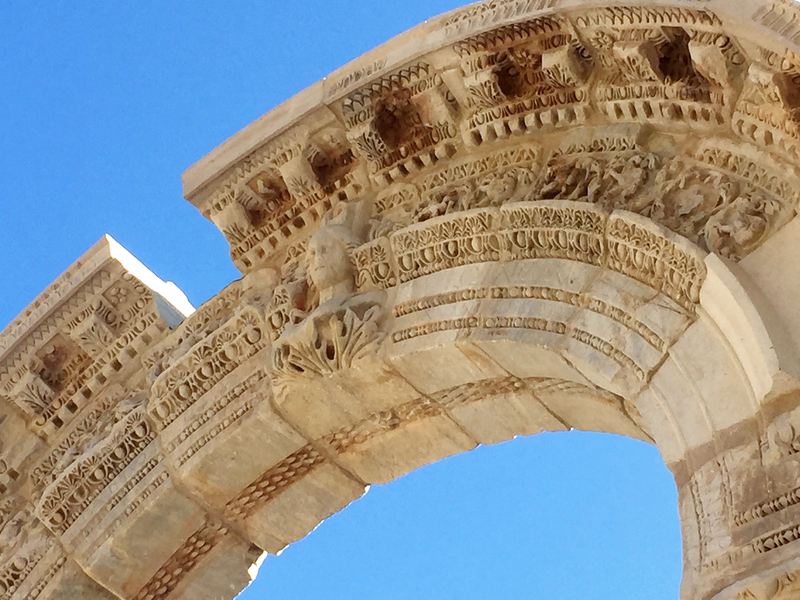 These ruins stand in mute testimony to the phenomenal endurance of the nearly 1,500-year-old Hagia Sophia. One more word about St. John and the historic sites here. One site that we didn’t go to was the purported house of the Virgin Mary. 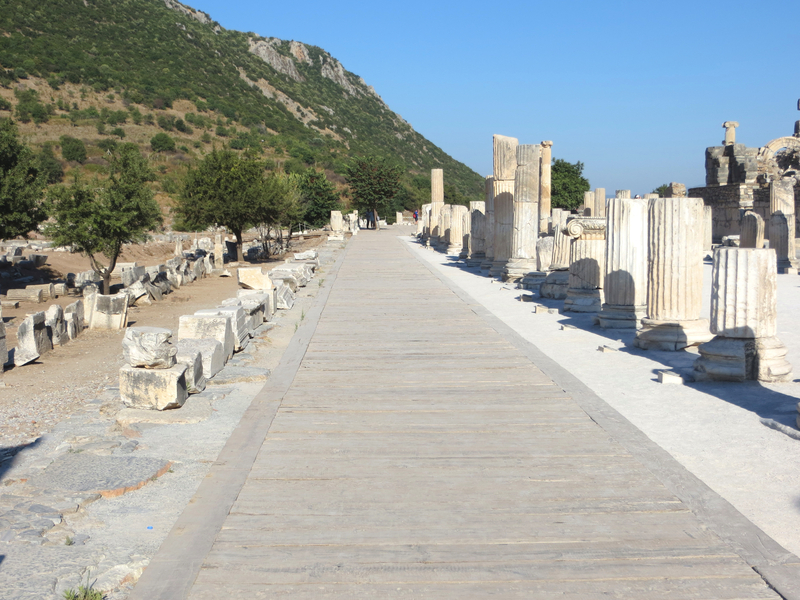 According to legend she accompanied John from Jerusalem to Ephesus and died here. Then in the early 19th century a crippled German nun claimed to have a mystical relationship with Mary; in visions, she saw where Mary had lived. A French priest followed her directions and – voila! – a shrine was discovered. Now, the only “evidence” that Mary was ever in Ephesus is that, while on the cross, Jesus told John to take care of his mother. That’s it. From that grew the legend that she must have lived in Ephesus near John and then a mystical nun “found” her house. Given the relative weakness of the case we decided to pass on her house. 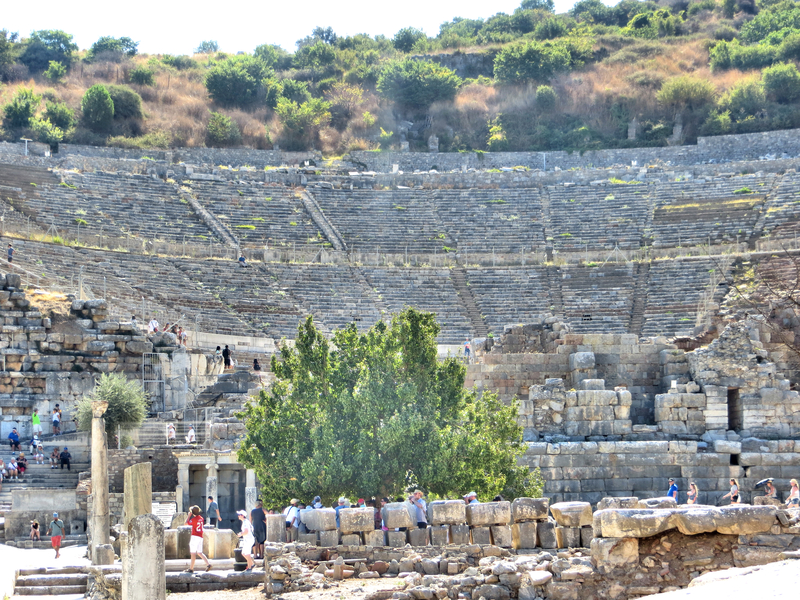 Oh, and besides that, I went there when I was in Ephesus in 1975, so I already have the picture. 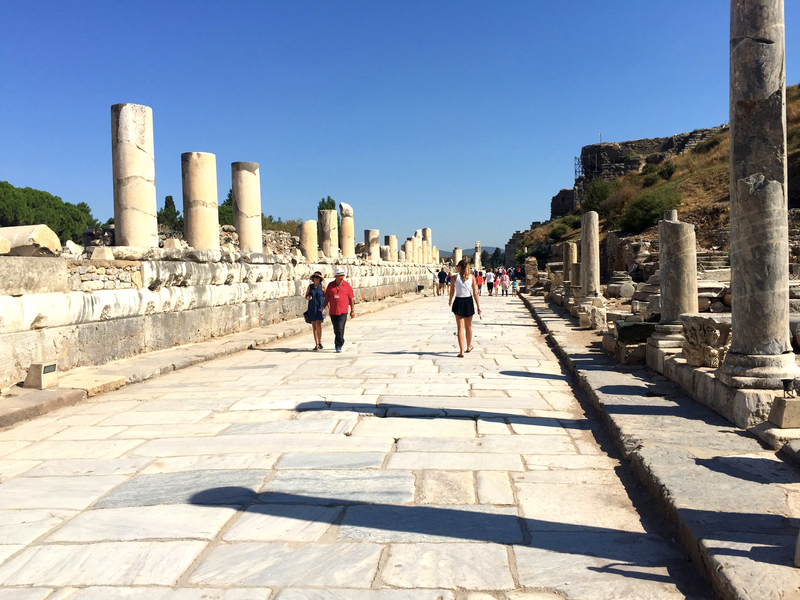 The next morning we headed out to the ruins of Ephesus itself to be there when it opened at 8:30, hoping to miss the worst of the crowds and heat. It was a good move, as the crowds really picked up later in the morning and it got really hot. The chance to walk through the remains of the central city in the cool morning air, with manageable crowds, was really something. 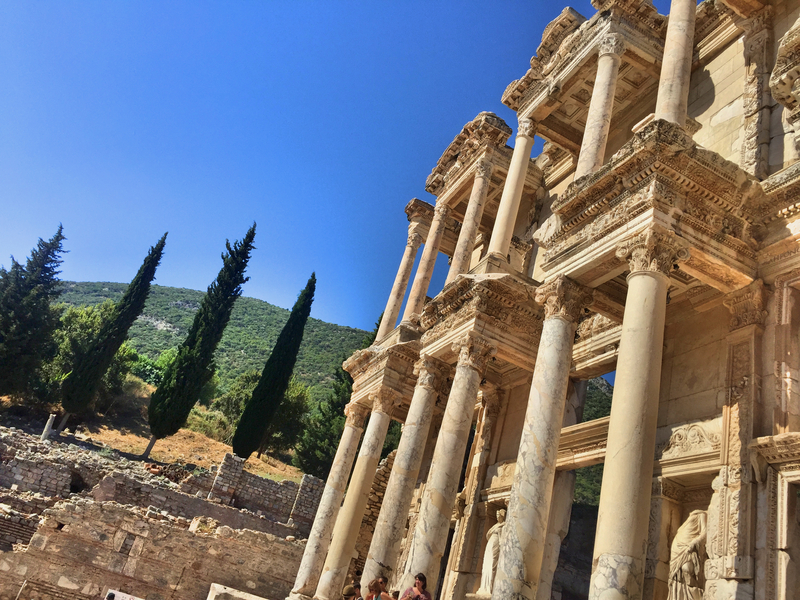 We’ve toured a lot of Roman and Greek ruins, but Ephesus might well be the most complete, the most alive, of any we’ve ever seen. You could really get a sense of the scale and grandeur of the place. And when you associate it with the people who walked on the same streets – Alexander the Great, Cleopatra, Mark Antony, Augustus, Hadrian, and on and on – it is genuinely awesome. Part way down Curetes Way archeologists have been recovering what are called the Terraced Houses, homes of some of Ephesus’s richest and most prominent citizens. The work there is simply remarkable. They’ve built stairs snaking up and down and around the site so you get a great view of six or seven different houses. 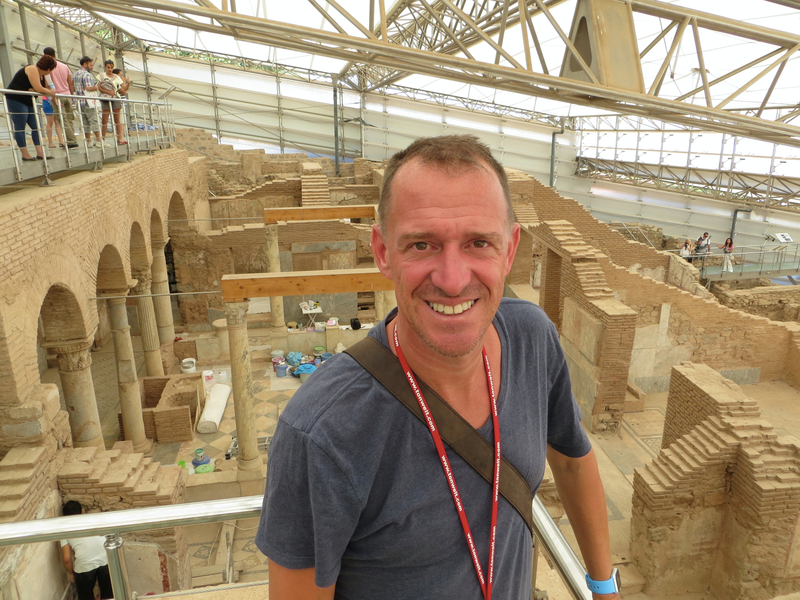 It includes some of the most intact ancient mosaics I’ve ever seen and great frescos. You get a real sense of how the houses were laid out and how impressive they were – grand halls, marble walls, even hot and cold baths. It’s a working site, so you can watch people doing their painstaking work to rebuild the ancient wonders. And to top it off (so to speak), the space is all covered by a somewhat translucent roof, making the space pleasantly cool on a day that was getting increasingly hot. They charge an extra few dollars to tour the area and we were very glad to have splurged. One of the rooms in the Terraced Houses. Note the mosaic floor and frescoed walls. 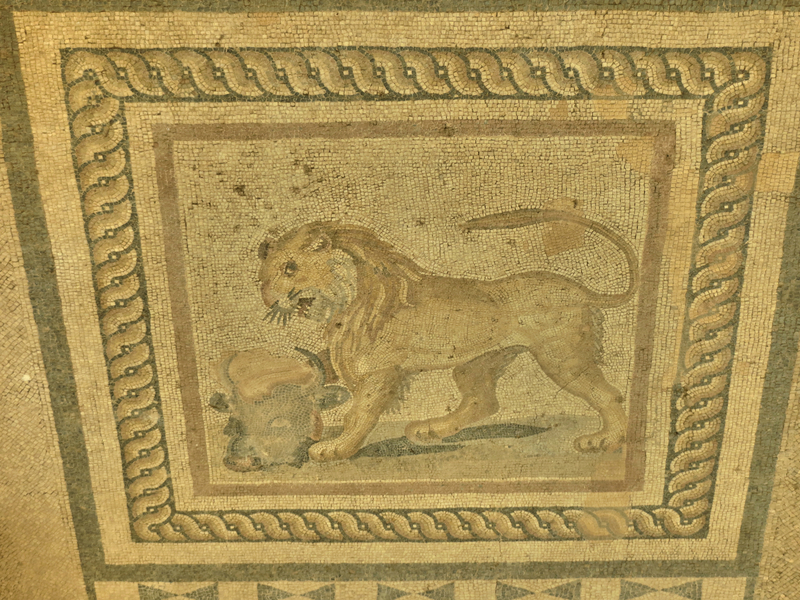 A closer view of just one piece of flooring, a lion devouring a lamb. Can’t blame him, I like lamb, too. 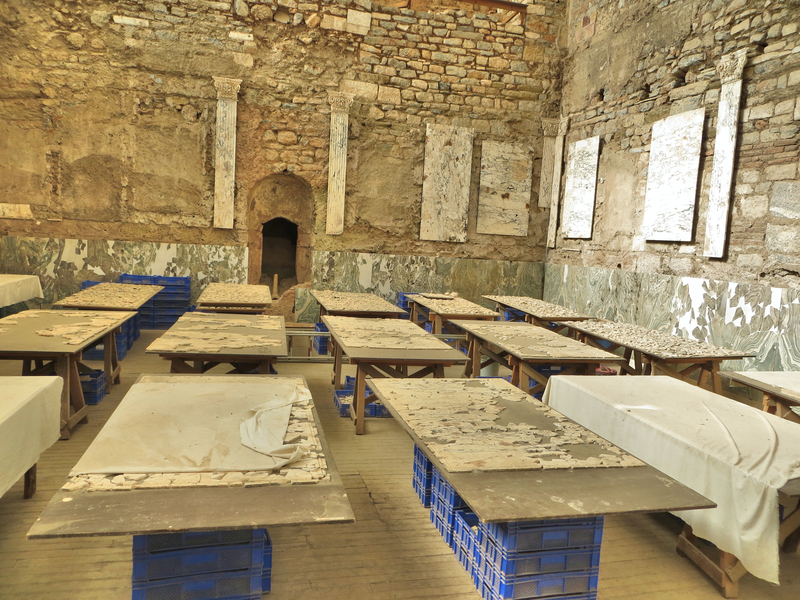 This is a workspace in the site, where they are apparently piecing together marble walls and mosaic floors. To me it looks like the damnedest jigsaw puzzle ever. Another highlight for me was the Church of Mary, an early 5th century church and supposedly the first church dedicated to Mary. Besides being cool ruins, the church played an important part in the early history of the Catholic Church. It was to this church in 431 AD that Emperor Theodosius summoned the church’s third ecumenical council, the Council of Ephesus. Over several weeks the leaders of the church debated the teachings of Nestorius, the Patriarch of Constantinople, that Mary gave birth to the human Jesus but not the God Jesus. It’s hard for me to understand or really even believe how important this distinction was at the time, but apparently it was a very big deal. Ultimately the council confirmed the Nicene Creed and condemned Nestorius’s teachings. And it all happened here! 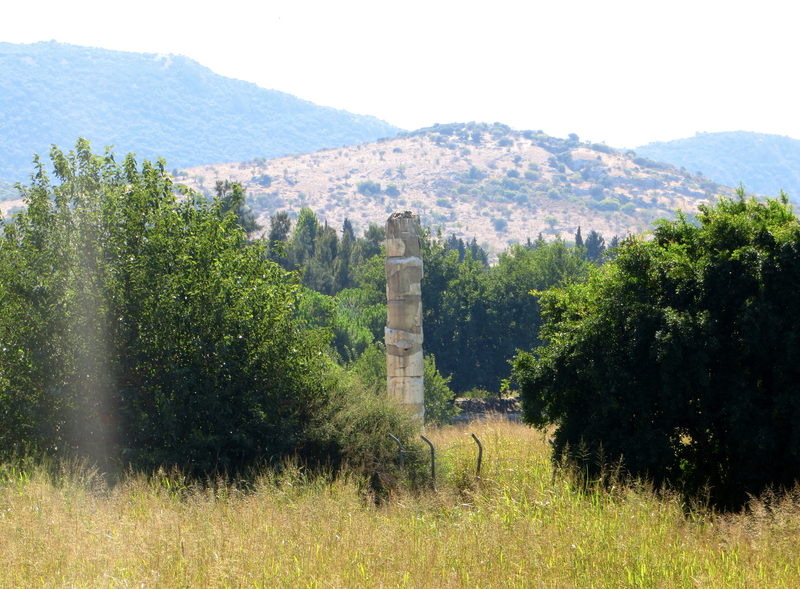 That’s what’s left of the Temple of Artemis. Pretty impressive, huh? 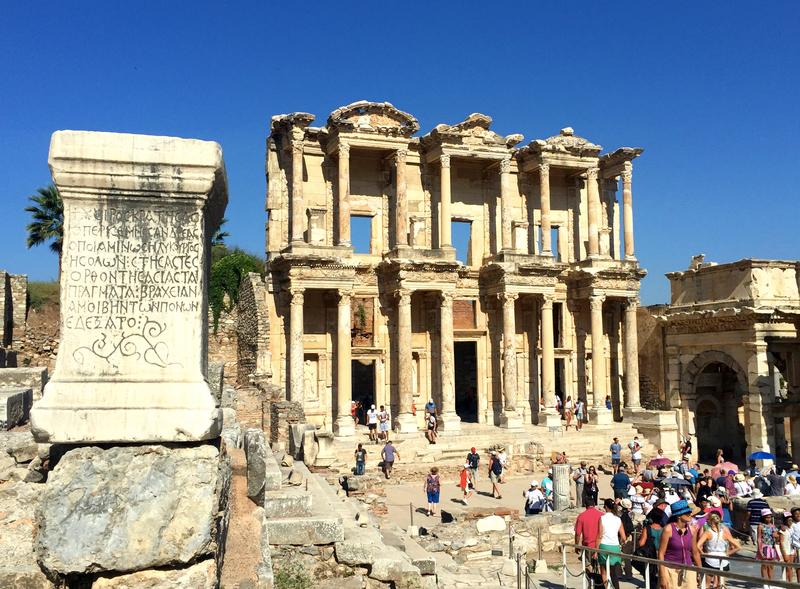 So that was Ephesus, a pretty great little stop. From here we’re heading north to Izmir, Turkey’s third largest city, for a couple of days and then we’ll continue wandering around Turkey. Here are some more photos that I just couldn’t resist. Harbor Street, connecting the ancient harbor to the Great Theater. When I was here 40 years ago our guide told us that this was the road that Mark Antony came up as he arrived to join forces with his lover Cleopatra for their fight to the finish with Octavius, who would soon become Caesar Augustus. A highlight of the stay was Ejdar Restaurant, a family-run place with Mom responsible for mezzos, Dad on the grill, and son serving. They say that Bill & Hillary ate here when he was President, so they were pretty impressed when Mark showed them the picture of me with Hillary. Now they think we’re Important People. 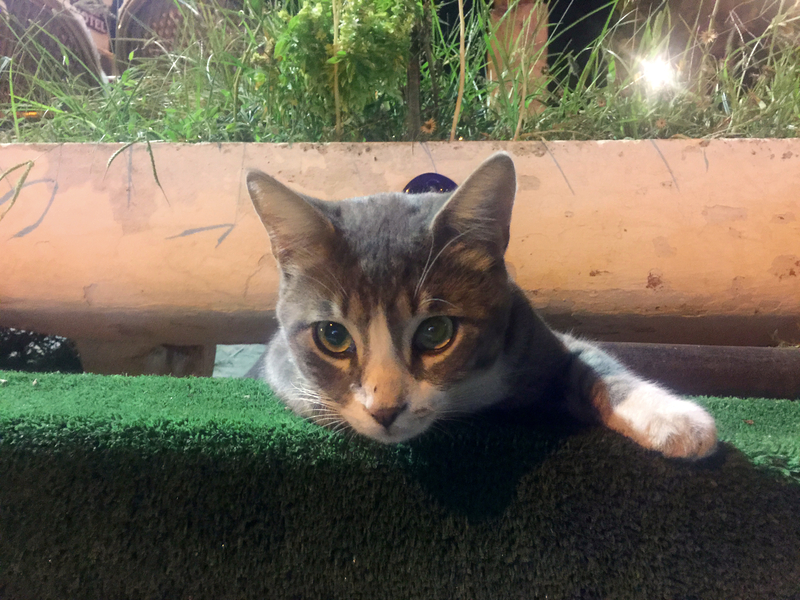 This little cutie was watching our dinner closely. And no, she didn’t go away hungry. 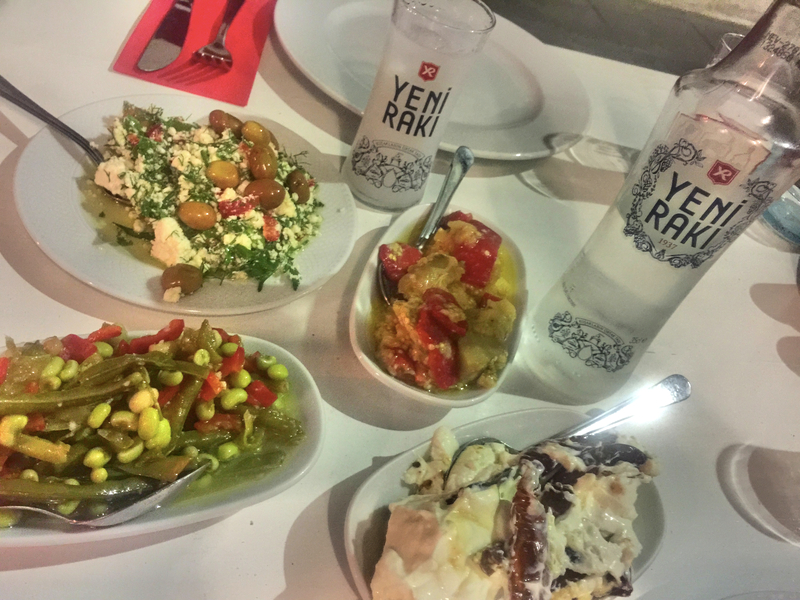 Turkish mezzes and Raki, an anise-flavored distilled beverage that goes perfectly with Turkish food. It took us a couple days to find this perfect meal, but we knew if we worked at it we’d get there eventually. And just like that we’re back in Asia. 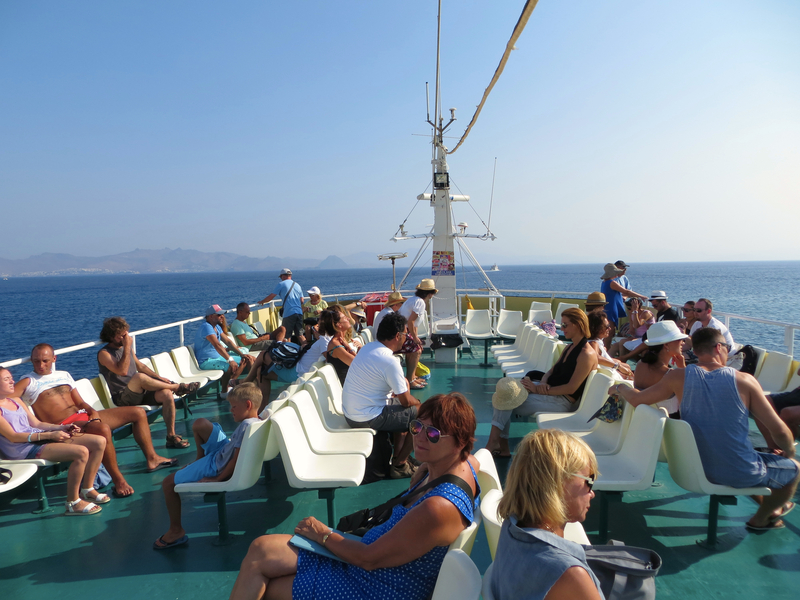 We caught a short boat ride from Kos to Bodrum, on the southwest corner of Turkey, the 40th country we’ve been to since leaving the U.S. 27-plus months ago. Two years ago, when we were on the Trans Siberian Railroad, we crossed the border between Asia and Europe overland going westbound, and now we’ve crossed eastbound by boat. Amusingly, I was in Anatolian Turkey 40 years ago when I was in the Navy, and I’m pretty sure I had no idea at the time that I was in Asia. But I was, and now we are again. Our ferry ride over to Turkey. Mark took this while I was sitting up there on the left reading. This is a great way to travel! 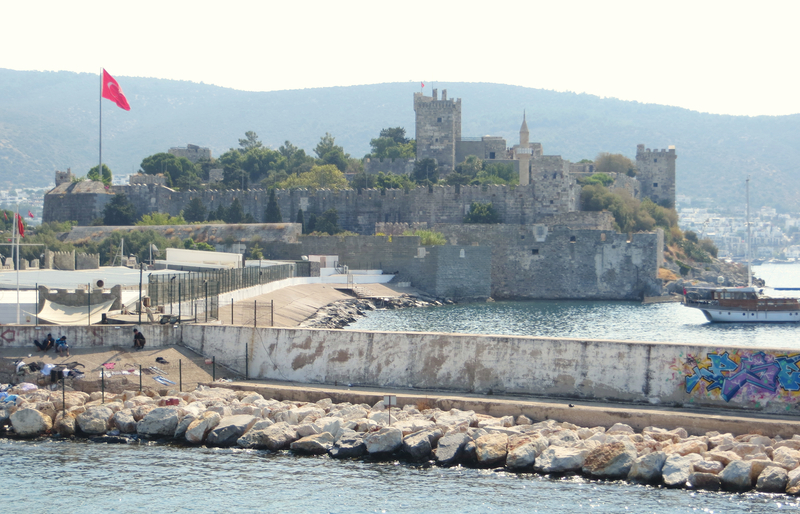 As we were pulling into Bodrum we passed the Castle of St. Peter or Petronium, built in the 15th century by those Knights of St. John we keep encountering. 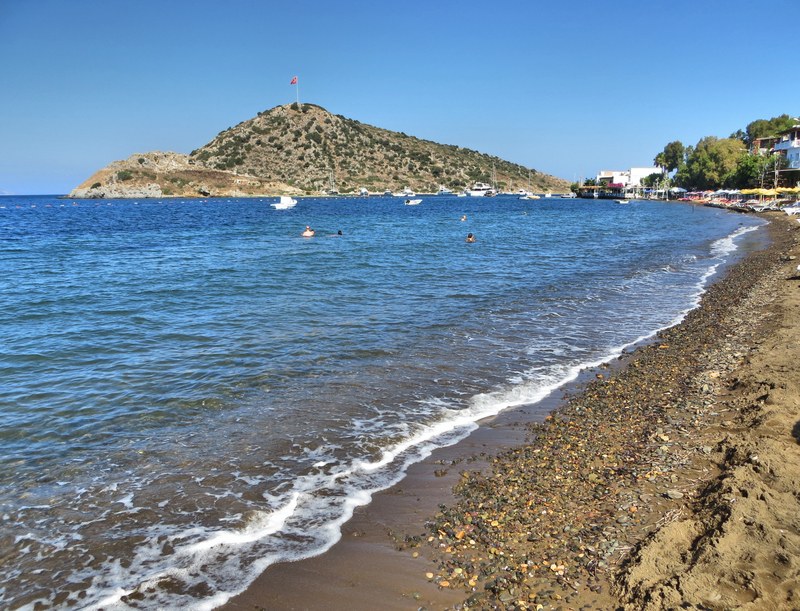 It is from Petronium that the current name Bodrum derives. I have to say, I’m a little surprised by the degree of culture shock in that short trip across to Turkey. All of a sudden we’re in a Muslim country. 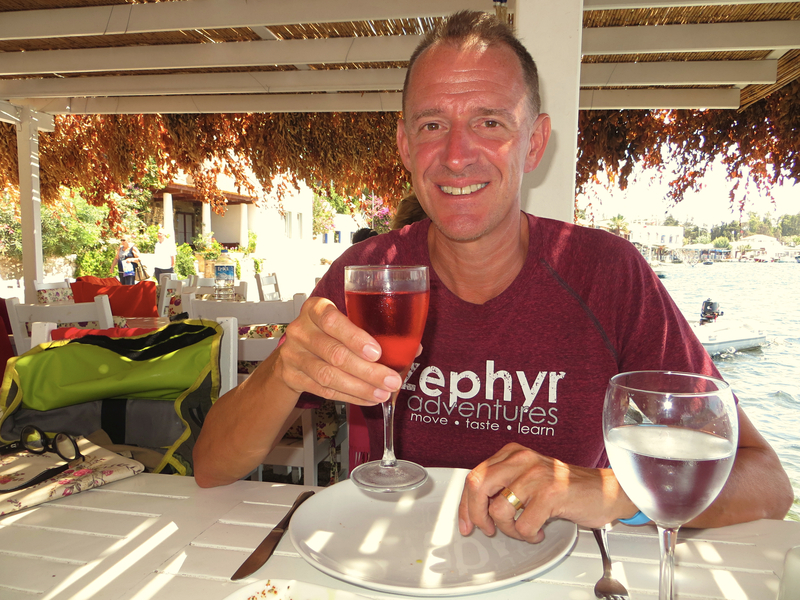 Wine is three or four times more expensive here than it was in Greece. You see lots of women wrapped up in scarves, though thankfully you don’t see (or at least we haven’t seen yet) the full Burkhas. There are surprising differences in the food. The people are a lot darker and, the men at least, swarthier. And it’s just a couple miles from Greece over here. After a couple days of wondering if we’d made a mistake, if perhaps we should have stayed in Greece maybe a while longer, though, we’re getting into the swing of things. 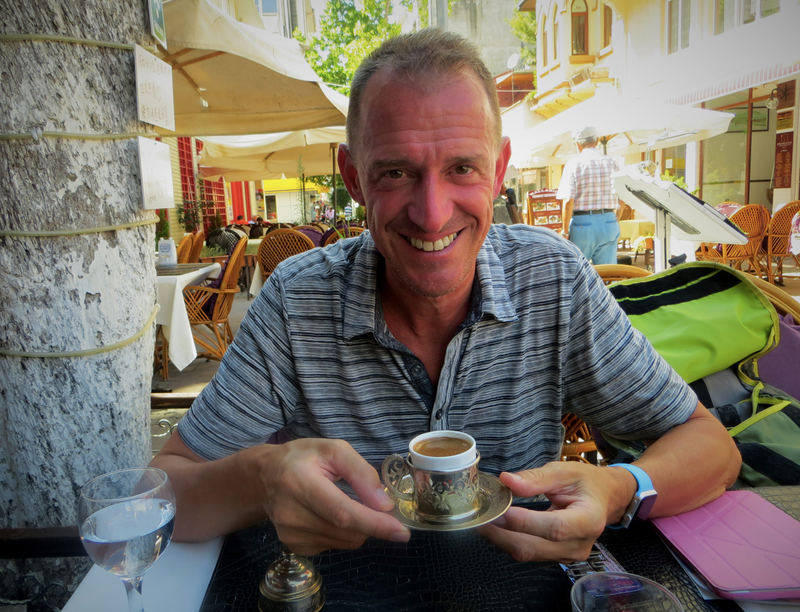 First, a word on Bodrum. Known in ancient times as Halicarnassus, it housed one of the original Seven Wonders of the Ancient World, the Tomb of Mausolus. 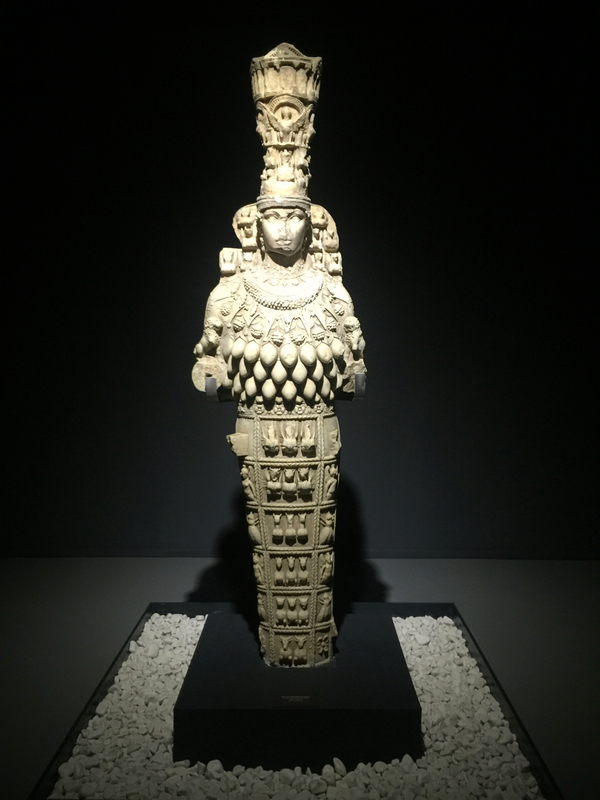 Mausolus was a Persian satrap who later switched sides to embrace the Greeks and whose wife (who was also his sister – yuck) ordered and directed construction of the massive tomb, from which the word mausoleum derives. Otherwise the most famous native of the city was Herodotus, the 5th century BC “father of history”, whose Histories is still available on Amazon.com. Like Mausolus, Herodotus also gave us a word: the English translation of his book is something more like Inquiries, but the Greek title Historia passed into Latin and thus we obviously get the word history. So that’s the background. 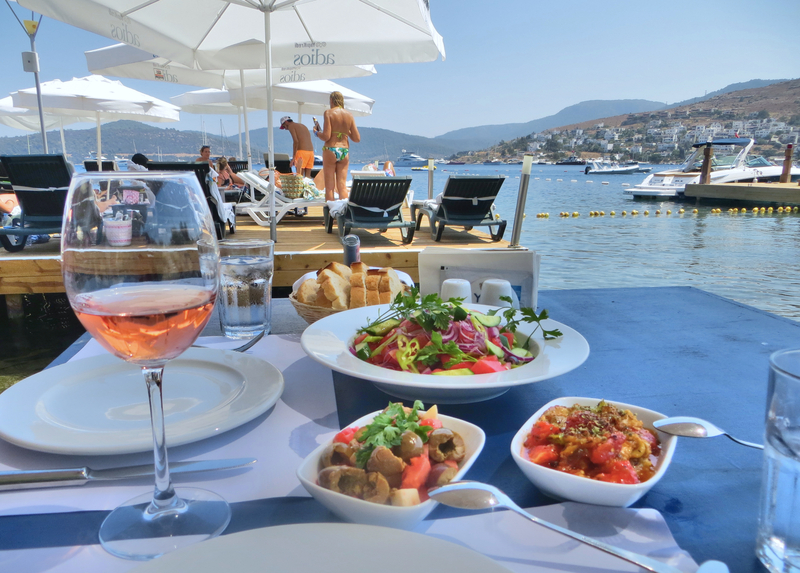 Today Bodrum is the main city on the peninsula of Bodrum and its major industry is tourism, particularly associated with beautiful beaches spread around the peninsula. So we took our four full days on the island to sample the various beaches. Each day we’d head down to the bus station, maybe 10 minutes from our hotel, and hop on a different bus to a different part of the island and a different beach. Everything from fancy Euro-rich yacht-types to more local downscale places. Everything from great lunch places to … not so great. The relatively simple beach at Gümüslück. 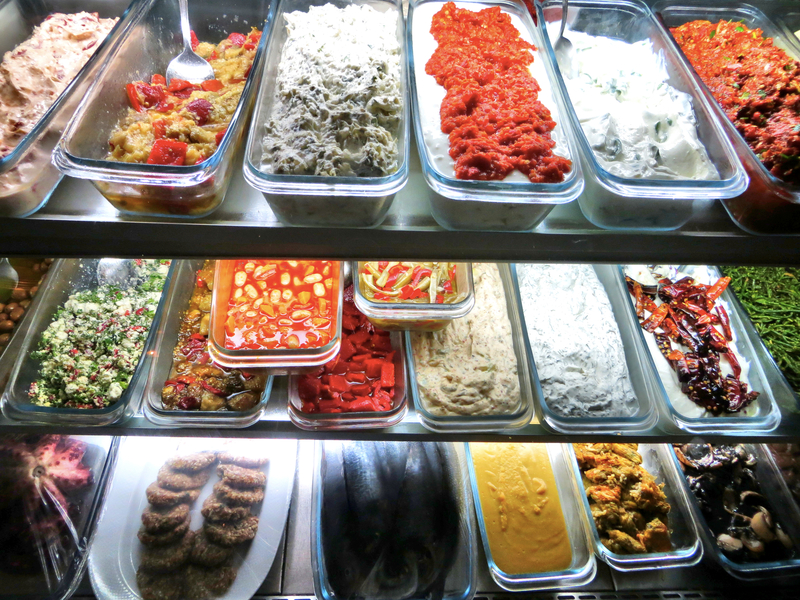 The beach was just ordinarily fabulous for the Mediterranean, but it’s where we got our first pretty-much-perfect Turkish lunch. 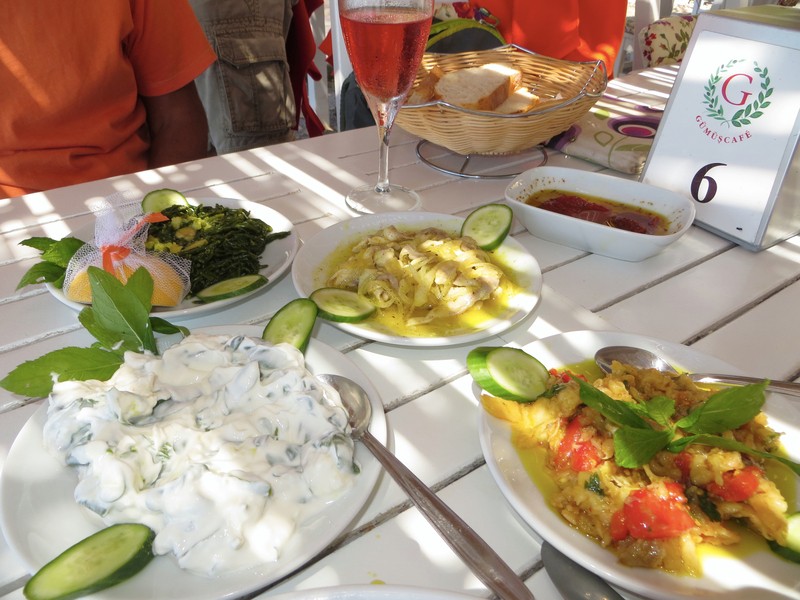 And here’s that lunch – some yoghurt, eggplant, fish something, and seaweed, with a nice rosé, of course. That was the start of Turkey. 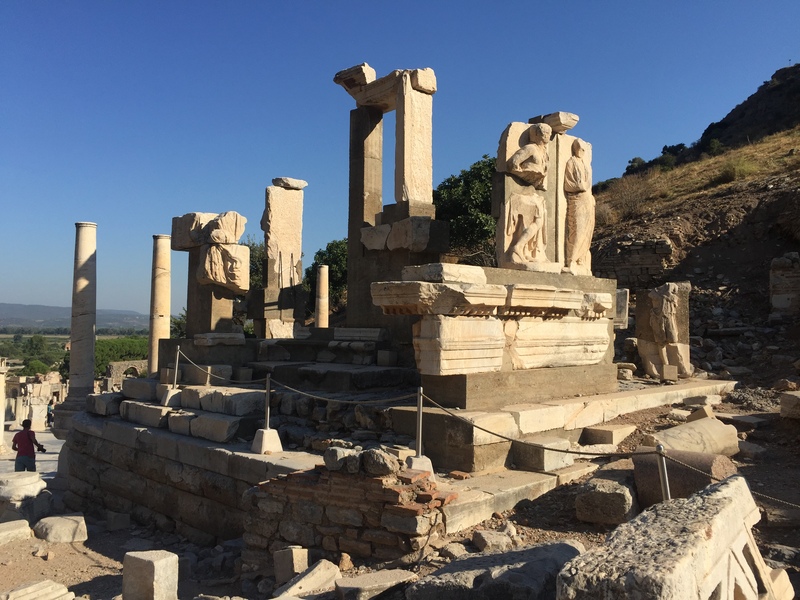 We’re going to spend a few weeks here, hopefully going up to the ruins of Ephesus, probably meeting a friend on the Lycian Way, likely going up to Cappadocia, maybe even exploring the capital Ankara. There’s so much to see, in fact, that we’re not at all sure we’re going to get to Istanbul, one of the great cities in the world. And it looks entirely as though we’re going to have to miss Lake Van (or Lake VAN as it’s known in our world): too far east and over in a part of the world that just might not be stable or safe. A lot of pictures of food, eh? This was a restaurant we went to twice. No menu, just whatever mezzes he made today (or probably yesterday, too) and then either grilled or fried calamari or octopus. We had the grilled octopus both times and it was incredible. 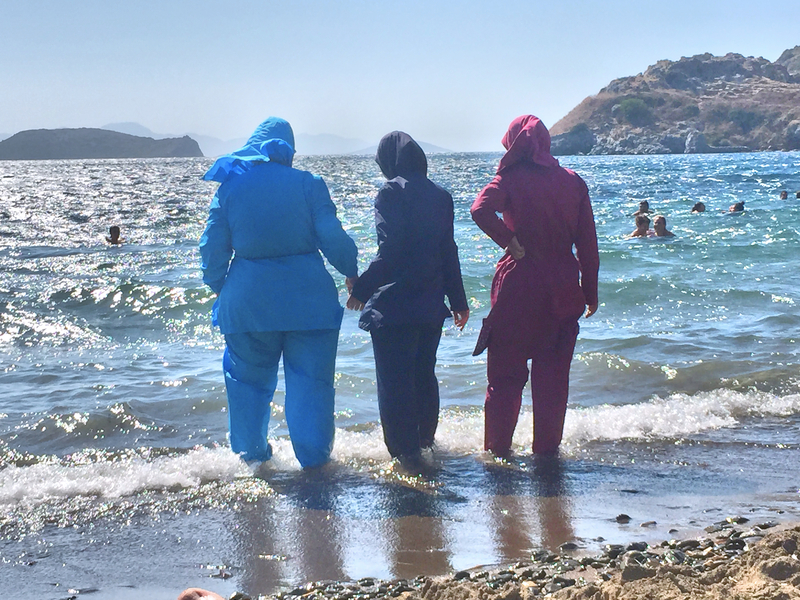 Muslim women going bathing in Gümüslük. And they weren’t just wading; in a few minutes they were all fully submerged, without ever showing any skin, god forbid.